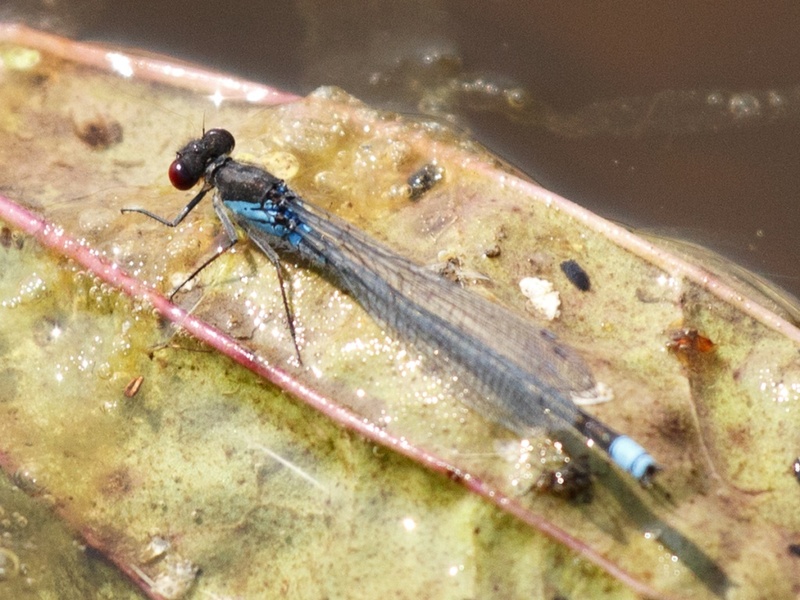 This species is quite a large and robust damselfly, with distinctive 'bug-eyed' look. 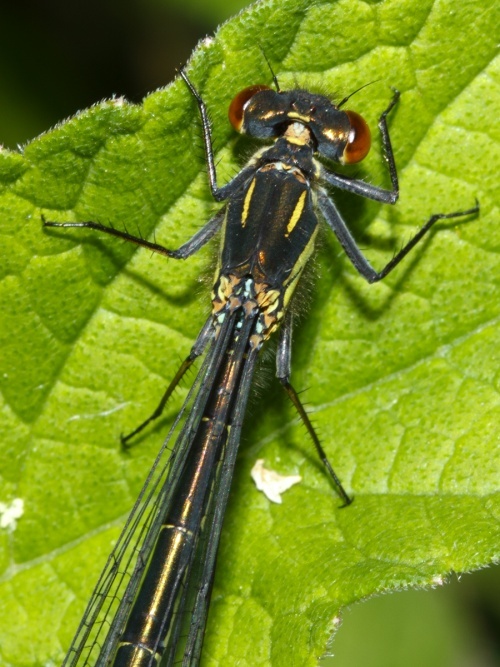 Adult males have blood-red eyes and tend to rest on floating vegetation. 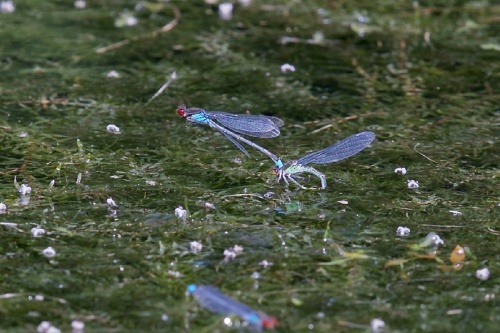 They are very territorial and chase off any other encroaching male. 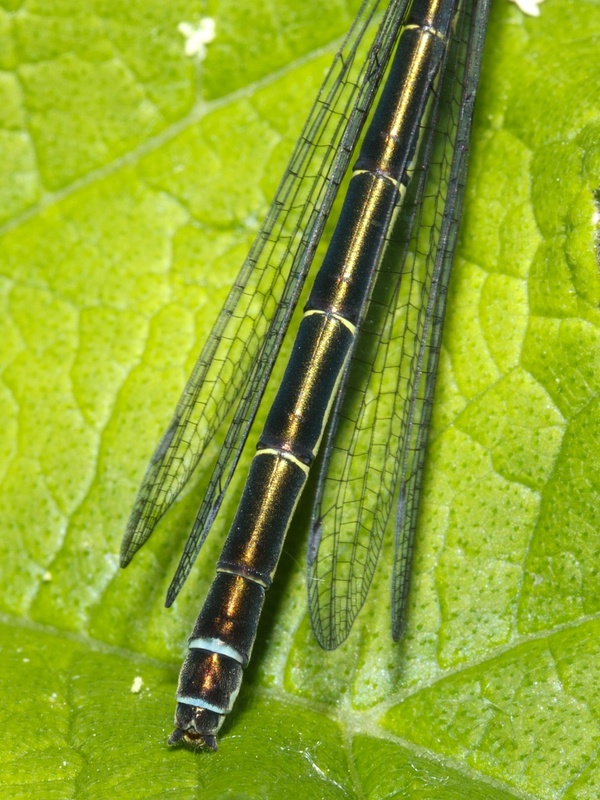 When newly emerged they have nearly all black bodies and dark eyes, but their larger size helps to distinguish them from other species. 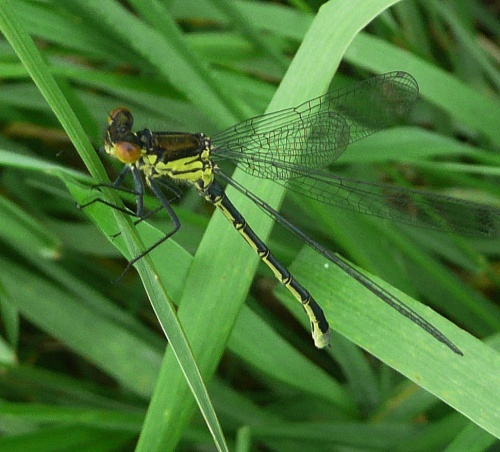 Immature males and females are generally yellow and black. 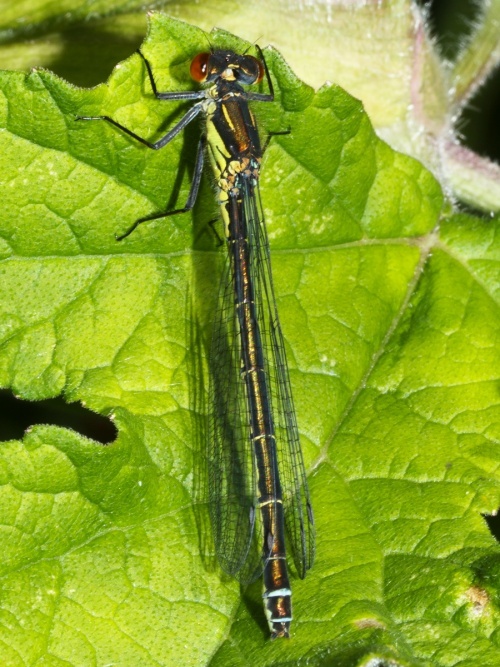 The main determining factor is the presence of expanses of floating vegetation on its favoured sites of still or slow moving water. Though territorial they are out-competed by the Common Blue Damselfly so tend to take up areas well away from the bank, using floating vegetation as their look-out. Most British records come from central and south-eastern England. 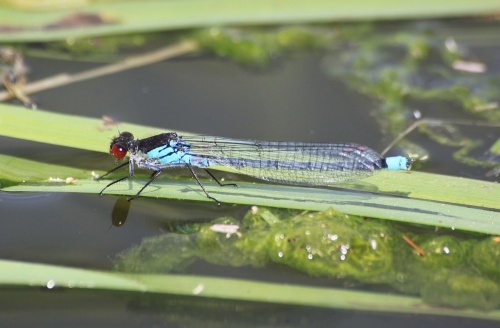 The Rivers Soar and Wreake and the Ashby, Grand Union and Grantham Canals are all well populated sites in the Leicestershire & Rutland area, but it is not particularly common anywhere in VC55. 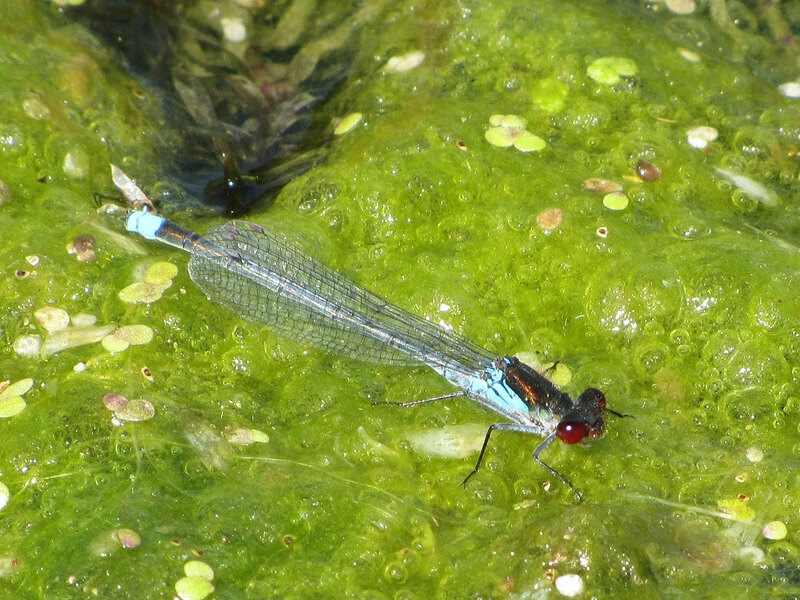 The single determining factor with regard to the current distribution of this species in VC 55 is the presence of expanses of floating vegetation on its favoured still water sites. 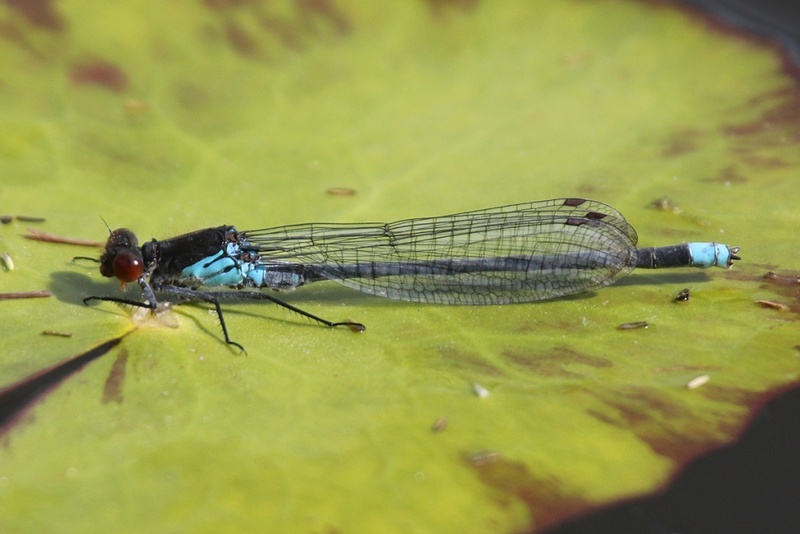 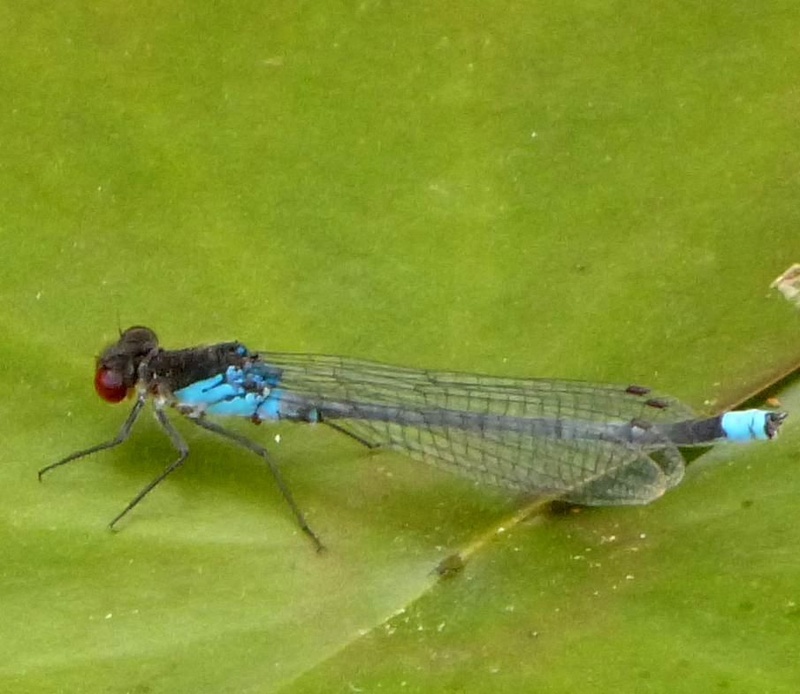 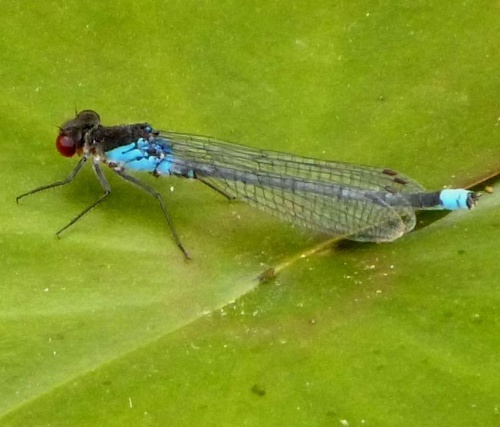 Where this habitat occurs the Red-eyed Damselfly can often be found, with the Rivers Soar and Wreake and the Ashby, Grand Union and Grantham Canals all being well populated sites. 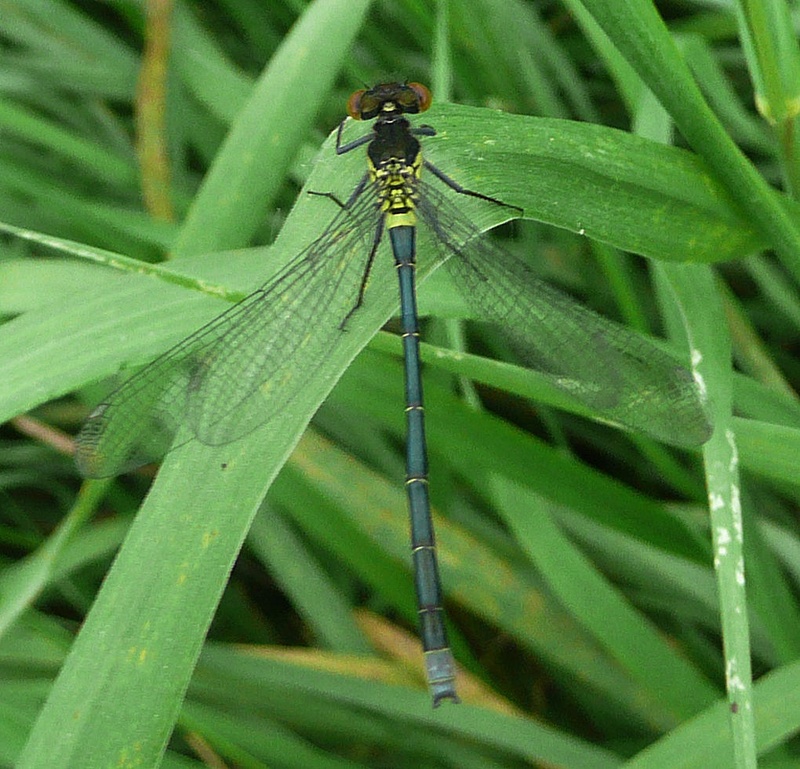 Historic records provide evidence that this species was 'locally common on the River Soar' in the 1930s (Roebuck, 1932). 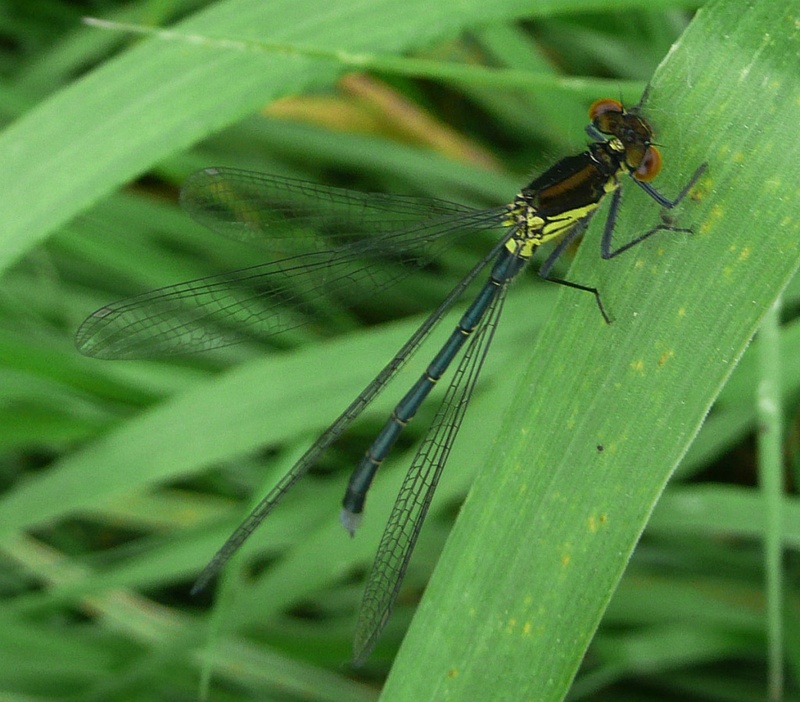 After an absence at this site through the latter half of the Twentieth Century it recolonised in the late 1990s. 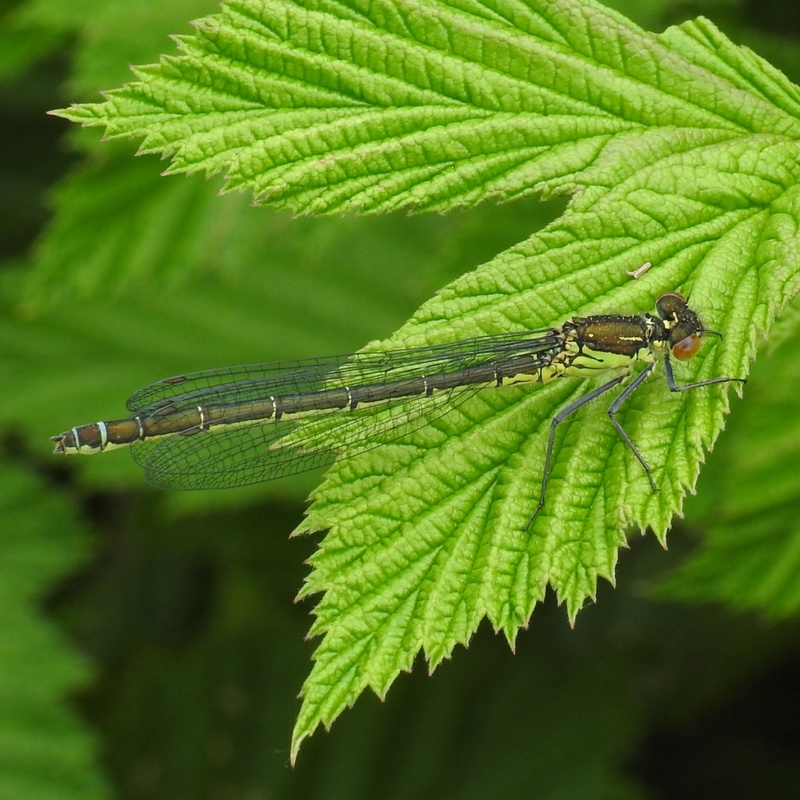 Through generally scarce in VC 55 until the latter stages of the Twentieth Century, it seems to have been consistently present on the Ashby and Grand Union Canals. 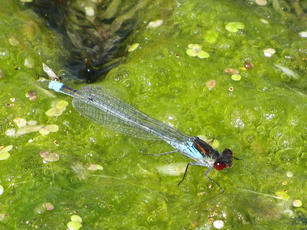 It was described as 'abundant, at Ashby Canal bordering Ambion Wood, Sutton Cheney' in 1963 (Mendel, 1980).